At most Pitt hackathons, hundreds of men line the desks and tables, chattering and hammering away on keyboards. Yet the women who can design and code just as well as them are largely absent. The environment meant for collaboration is undoubtedly male — and unwelcoming. According to Mackenzie Ball, the outreach coordinator for Pitt’s Computer Science Department, women who attend the mostly-men hackathons feel uncomfortable. At She Innovates, the annual women-only hackathon which Ball co-organizes, Ball asks the women there each year how they feel about the mixed-gender events. About 38 women attended She Innovates this year. But at its most recent hackathon, SteelHacks, only 36 of the 250 attendees were women. Throughout the school year, Pitt hosts traditional, mixed-gender hackathons, which are weekend-long events of intense project collaboration between programmers and computer scientists. She Innovates, though, is geared specifically toward female coders and hackers who want to collaborate with other women, but who maybe don’t feel confident or comfortable enough to start out at a traditional hackathon. According to Ball, Pitt’s Innovation Institute uses She Innovates, which comes less than a month before Pitt’s second hackathon of the year, SteelHacks, to build up women’s confidence before they branch out to other events. Pitt’s Innovation Institute held She Innovates at Sennott Square from Jan. 29 to 31 and had 38 female participants, who collaborated for more than 40 hours to create web applications to help women and log volunteer hours..
Then, at SteelHacks, which sophomore computer science major Ritwik Gupta started in 2015, teams of two to five participants used the William Pitt Union’s Assembly Room as the main hacking space for collaboration on hardware or software-based projects. One of those hackers was senior computer science major Becca Addison, who participated in both events this year. Addison said she wished there had been more female hackers at SteelHacks, as the entire process of designing and developing web applications and programs will suffer without women in technology. In the United States, women represent 59 percent of the work force, according to U.S. Census data, but hold only 30 percent of the jobs in the tech and computer science industry, according to profiles of top tech companies like Google, Amazon and Microsoft. Ball said she and co-organizer Babs Carryer, who is also the Innovation Institute’s director for education and outreach, designed She Innovates to allow first-time female programmers to participate without feeling intimidated by the traditionally male-dominated tech culture. According to a February study by California Polytechnic State University and North Carolina State University, women are more competent coders than men, but their work is not valued as highly as their male colleagues. The study analyzed Github, an open-source platform for sharing code, submissions from 1.4 million men and women and found that when gender was hidden, women’s code was accepted 78.6 percent of the time, and men’s code only 74.6 percent of the time. Yet when gender was apparent, women’s code was accepted less often than men’s. Addison said she was nervous to participate in She Innovates because she wasn’t sure of her ideas and input. But at She Innovates, Addison learned that no one at a hackathon is an expert, and that she should treat the events as learning exercises. 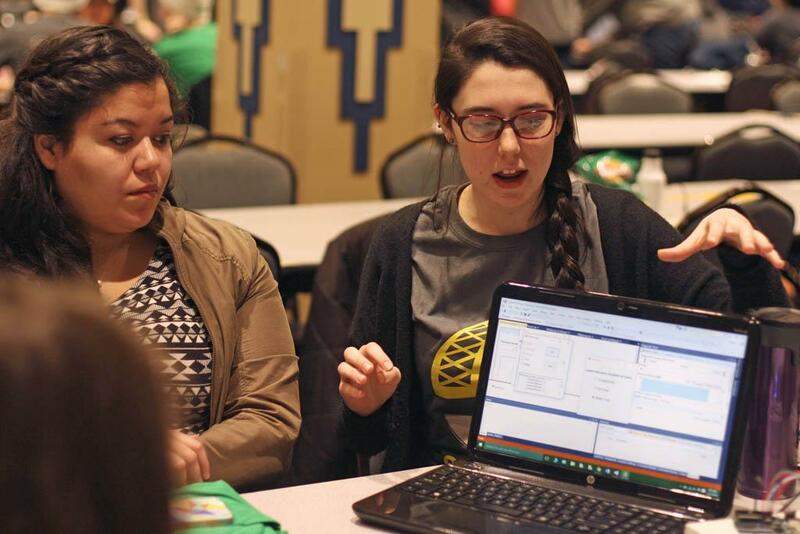 Emilee Betz, a junior computer science major, pushed herself out of her insecurity and into the world of competitive coding at She Innovates 2015 before jumping into her first traditional hackathon at SteelHacks 2015. Though Betz was an organizer at this year’s She Innovates, she felt like a novice hacker just last year. After Betz’s She Innovates team won second place last year and produced a working app over the course of the weekend, Betz said her doubts dissipated. Betz said she sees this gender disparity regularly in her computer science classes, where she is often one of three or fewer women. According to Betz, a difference in how society treats young boys and young girls causes this disparity. Betz said educators should introduce computer science to children — especially girls — when they’re young, to get them interested in programming and technology at an early age. In part to make computer science education more accessible, Betz and her all-female SteelHacks team created an educational app to show novice programmers what different command structures look like. The app allows a learner to type in a sequence of code to make an LED board light up in different colors. Addison’s team created an app colored “Color Blind” that identifies a selected color within a photo, for example a shirt color, and matches it, to a pair of pants. Addison said the general concept was the app would allow individuals with color blindness to get dressed on their own. Gupta said hackathons need more diversity to usher more viewpoints and problem-solving strategies through the doors.